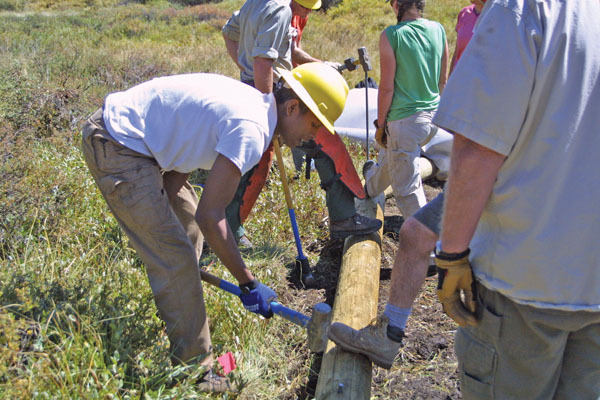 Volunteers for Outdoor Colorado teamed with Friends of the Dillon Ranger District and the U.S. Forest Service to construct a hiking and mountain biking trail in the Soda Creek Trail system near Keystone. The two-day project began Saturday with 50 volunteers from Summit County and the Front Range and will continue through this afternoon. The improvements include the construction of a turnpike to protect wetland areas and direct bike traffic. A turnpike is an elevated path supported by logs and filled with rock and dirt. The 150-foot structure stretches across a section that has been “notoriously muddy for years,” said Claudia Wiley, a trail technician for Volunteers for Outdoor Colorado. The Soda Creek mountain bike path will remain open through the construction, which concludes at 2 p.m. today. Mountain bikers are currently being directed around the construction area. The trail is being constructed from the recommendation of the U.S. Forest Service. Creating a prominent, elevated trail should limit the different trails that mountain bikers create and protect the wetland area. The trail construction project, though hard work, offered many perks to its 50 volunteers who came from as far as Colorado Springs. The weekend-long project, began Saturday morning and extend into this afternoon, providing all meals for volunteers as well as live musical entertainment by Randall McKinnon who played guitar for volunteers Saturday night. Alongside the volunteer project, an environmental education program called the Young Stewards is teaching kids age 6-12 about outdoor stewardship. Volunteers for Outdoor Colorado is a nonprofit volunteer organization that works with local entities like Friends of the Dillon Ranger District and the Forest Service to motivate and enable citizens to be active stewards of Colorado’s natural resources. The organization organizes projects throughout the year involving hundreds of volunteers.